The historic low overnight cash rate has led to a record boom in Australian property prices. House prices in Brisbane, Melbourne and Sydney are seeing record highs. After the end of the most recent commodity boom, the Perth property market is the only capital city seeing relative subdued sentiment. On one hand, the state government budgets are enjoying record stamp duty revenue but the other, high prices have priced out First Home buyers. It is no secret that we been bearish on the Australian real estate market where the investor chase for yield poses systemic risk to the economy. Investor balance sheet is over leveraged and susceptible to price falls. Now there are evidence that the overwhelming apartment supply coming online are facing settlement risks. But Australia residential real estate can be seen as a tale of two cities. While the capital city markets are seeing record highs in median house prices, the mining towns that are at the coal face of post commodity recovery are still struggling. In most cases where there were high paying mining jobs, they are never coming back. Investors were attracted to mining towns due to the relatively high rental yield and positive cash flow compared to inner city properties. But the high yield of these investments was to compensate the buyer for the risk in investing in these towns. The post boom period shows the real risk of investing in regional areas exposed to major mining projects. As the commodity prices has fallen, there are no new developments in the pipeline after completion of existing projects. As matter of fact, unemployment rate is expected to increases as existing uneconomical mines are closed. Gladstone is a prime example of what can happen once the construction jobs disappear once major mining and LNG projects are completed. 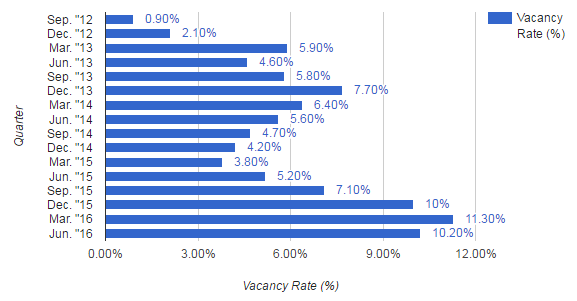 During the boom period, the vacancy rate bottomed at 0.9% and it has trended up to 10% in the most recent quarter. Property prices has also saw severed decline which proves again that “property value never fall” to be false. This is a cautionary tale of ignoring the risks of investing in mining towns, believing the current trend will last forever and not conscious of where we are in the cycle. Everything that goes up must come down.